Saudi Arabia's King Abdullah, a key player in Middle East politics, said he fears conflicts in the Palestinian territories, Lebanon and Iraq could explode into a global one, adding that his monarchy was making great efforts to reach peace. "My fears are similar to those of all sensible people, that the continuation of all these conflicts will provoke an explosion that will not be restricted to the region, but will have global dimensions," the monarch told Spain's leading daily El Pais in an interview published Monday prior to his arrival in Spain for a three-day visit. Regarding the latest outbreak of internal Palestinian violence, Abdullah said: "I feel profoundly hurt by what is happening in Palestine. We are in contact with all the parties involved within the Palestinian community," he said in the interview conducted in Morocco. Saudi Arabia has commented little on the recent clashes in Gaza between Hamas and their rivals in the Fatah movement - a sign some see as anger at the two sides and reluctance to get involved. In February, the kingdom hosted a summit between Palestinian President Mahmoud Abbas of Fatah and Hamas leader Khaled Mashaal aimed at ending a previous bout of fighting between them. The meeting in the holy city of Mecca ended with a deal on a Hamas-Fatah unity government that Saudi Arabia touted as a major breakthrough - and that has now collapsed, following Hamas' violent takeover of the Gaza Strip last week. "The Middle East has suffered from one of the longest conflicts of contemporary history, the Israeli-Palestinian clash and the side effects including Israeli occupation of Arab lands," King Abdullah told El Pais. "Just as we are deploying enormous efforts to resolve these conflict, we have the extensions of instability in Iraq and Lebanon, and let's not forget Darfur," he said. 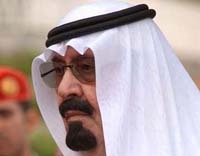 Abdullah described the Iranian nuclear issue as another problem for the region. "Our position is based fundamentally on supporting the nonproliferation of nuclear arms in the region and in working to reach a peaceful arrangement to the Iranian dossier, far from the tension and agitation which dominates current dialogue," the Saudi monarch said. He defended every country's right to nuclear energy for peaceful purposes, "as long as this criteria is applied to each of the countries in the region without exception." He said his recent meetings with Iranian President Mahmoud Ahmadinejad were within a framework of meetings with regional leaders to discuss and resolve conflicts. Asked whether he thought the international community should accept the idea of a nuclear Iran, Abdullah said, "With respect to nuclear arms, I am profoundly convinced that the world would be better without them. No country needs them, and as such it's unnecessary for any to maintain a nuclear capacity." In Spain, Abdullah is to meet with King Juan Carlos later Monday and Prime Minister Jose Luis Rodriguez Zapatero on Tuesday. Zapatero's government has striven to get the European Union to make greater efforts toward a new Middle East peace initiative but the reception from Israeli and Palestinian officials has been lukewarm. Abdullah, however, had words of praise for Spain and Turkey's Alliance of Civilizations proposal, which is aimed at encouraging dialogue between the West and Muslim countries and which has been formally adopted by the United Nations. Abdullah arrives in Madrid 5:30 p.m. He leaves on Wednesday.